O. Palmer Robertson is Director and Principal of African Bible College, Uganda, and Professor of Theology at African Bible College, Malawi. Formerly, he had been on the faculties of Knox, Covenant, Westminster, and Reformed Seminaries. He is the author of several books, including The Christ of the Covenants, Understanding the Land of the Bible, and The Israel of God. I mention these things to inform the reader that Robertson is a staunch covenant theologian and his books reflect that very much. 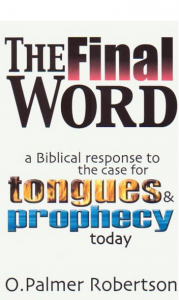 However, the subject of the cessation of inspiration, tongues, and prophecy is a needed subject today and Robertson adds important information to that view. Though he does not take his case from 1 Cor. 13, he does believe the canon was closed in the first century and that God’s revelation ceased then. As to tongues, he believes they were revelational in nature and therefore were concluded in the first century also. Robertson has an interesting study on the parallel of tongues speaking with the spread of the Gospel as outlined in Acts 1:8. As the gospel was spread to those four regions, tongues also appeared there as a witness. When the gospel had covered those areas, tongues ceased in the New Testament. Also interesting is his view that women both prophesied and spoke in tongues because God allowed them to participate in “forthtelling” revelation, but when revelation ceased (in the first century), so did women’s role of speaking authoritatively in the church.